Unless you’ve been too busy finding the best bar to watch the NBA Finals from, you should know that the ECB had just published its latest monetary policy decision. In addition, the Organization of the Petroleum Exporting Countries (OPEC) has also finished another meeting over oil production. The ECB is on wait-and-see mode. The ECB left its rates unchanged with the rates for the main refinancing operations, marginal lending facility, and deposit facility still at 0.00%, 0.25%, and -0.40% respectively. Not surprising, since some of the bank’s previous decisions will only be implemented this month. Corporate bond purchases will start on June 8 while the new series of TLTRO will begin on June 22. Draghi pointed to the risks of a potential Brexit, saying that this month’s referendum is a clear downside risk to growth. He also cautioned that the slowdown in the global economy and persistence of low inflation could push the central bank into adding more stimulus and maybe extending its QE program beyond 2017. Yikes! Upgraded growth and inflation forecasts. The rise in oil prices and the impact of the ECB’s stimulus gave the central bank confidence to raise its inflation forecasts for the first time in a year. The ECB now expects consumer prices to grow by 0.2% in 2016, higher than the 0.1% uptick it expected back in March. It also held its 2017 and 2018 forecasts steady at 1.3% and 1.6% respectively. Draghi and his team also felt more optimistic towards growth, upgrading its 2016 growth estimates from 1.4% to 1.6%. They kept their 2017 figures unchanged at 1.7% though, and trimmed their 2018 forecasts from 1.8% to 1.7%. 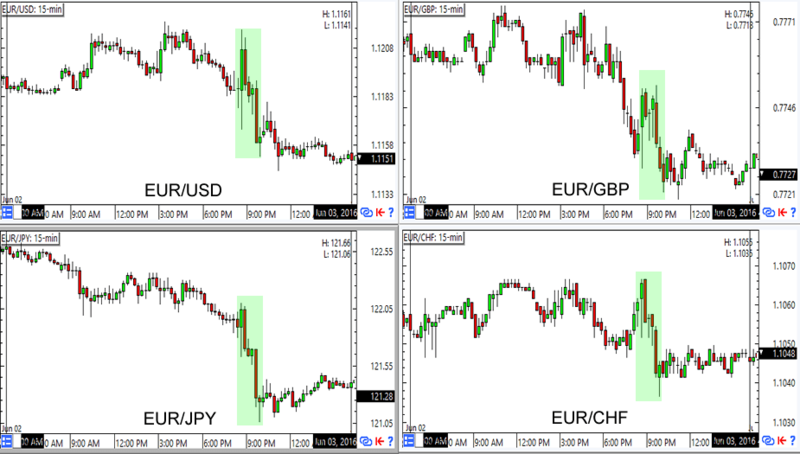 The EUR bears came out to play. Draghi’s cautious optimism didn’t sit well with the euro traders, since there’s a real chance that inflation would miss the ECB’s expectations and pave the way for more easing. For one thing, actual inflation has missed the ECB’s targets for years. It also doesn’t help that the central bank had downgraded its outlook for consumption and government consumption which are underlying pressures for core price growth. No deal. Oil prices rose in the days leading up to the meeting in Vienna on the assumption that the world’s oil leaders would come up with something to address the global oil supply glut. Output freezes were off the table but proposals of a collective output quota (from Saudi Arabia) and country-specific quotas (from Iran) have gained support. Unfortunately, the OPEC’s members have agreed to disagree. By the end of the day Saudi Arabia’s new Energy Minister Khalid al-Falih only said that implementing any “artificial ceiling” would be premature but has pinky swore that it won’t flood the markets with extra oil. Meanwhile, Iran’s Oil Minister Bijan Zanganeh also stated that he saw no signs that the other member countries are interested in boosting their outputs steeply. The market is “rebalancing.” The biggest reason for the votes against any production cap was that the members believe that the oil market is “rebalancing.” They said that demand is rising in the U.S., India, and other major oil consumers while shale production in the U.S. has declined on the back of lower oil prices. It also doesn’t hurt that crude oil prices have risen by 80% since their last summit in December. Saudi’s Khalid al-Falih even cheered that supply and demand trends are “all good” and that oil prices have recovered and will continue to recover. OPEC has a new Secretary-General. Delegates who were disappointed with the non-action consoled themselves by saying that the meeting had achieved its main purpose, which is to choose a new secretary-general. Enter Nigeria’s Mohammed Barkindo, former head honcho of state oil firm NPPC. In an interview, Barkindo said that the cartel may implement an output ceiling in the future, but is currently comfortable without one. Good to know. Oil prices fell. 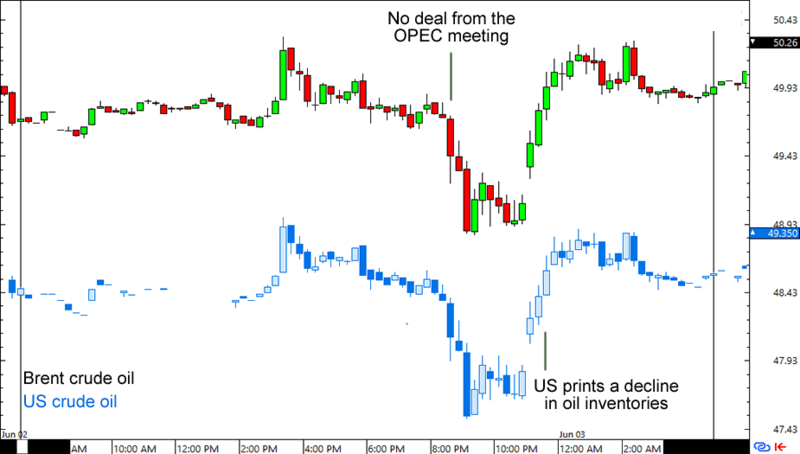 Both Brent and U.S. crude oil prices fell at the lack of action from the OPEC members. And why not? Oil-dependent economies like the Fragile Five (Venezuela, Nigeria, Iraq, Libya, Algeria) will continue to feel the pressure of low oil prices. Some investors also worry that the market’s “rebalancing” is mostly from the supply side with infrastructure disruptions in Nigeria, Venezuela, Libya, and even Canada barely making up for the threat of slowdown in global economic growth. Prices eventually recovered though, thanks to a U.S. report showing a decline in crude oil inventories.